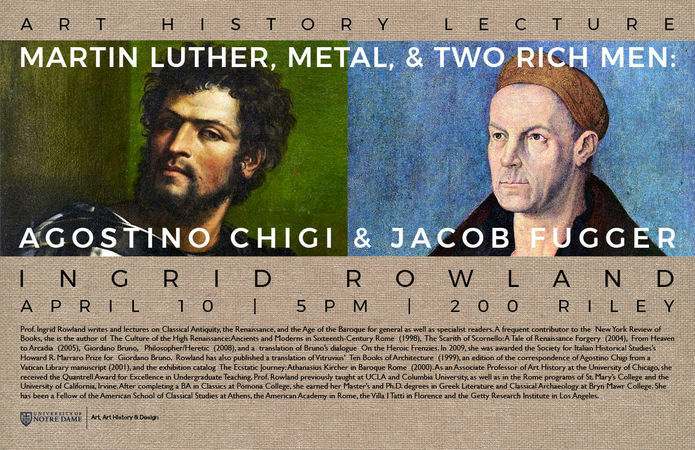 Please join us for a public lecture by Professor Ingrid Rowland entitled, “Martin Luther, Metal, and Two Rich Men: Agostino Chigi and Jakob Fugger.” The lecture will take place on April 10, 2018, at 5 PM in 200 Riley Hall of Art. Prof. Ingrid Rowland writes and lectures on Classical Antiquity, the Renaissance, and the Age of the Baroque for general as well as specialist readers. A frequent contributor to the New York Review of Books, she is the author of The Culture of the High Renaissance: Ancients and Moderns in Sixteenth-Century Rome (1998), The Scarith of Scornello: A Tale of Renaissance Forgery (2004), From Heaven to Arcadia (2005), Giordano Bruno, Philosopher/Heretic (2008), and a translation of Bruno’s dialogue On the Heroic Frenzies. In 2009, she was awarded the Society for Italian Historical Studies’s Howard R. Marraro Prize for Giordano Bruno. Rowland has also published a translation of Vitruvius’ Ten Books of Architecture (1999), an edition of the correspondence of Agostino Chigi from a Vatican Library manuscript (2001), and the exhibition catalog The Ecstatic Journey: Athanasius Kircher in Baroque Rome (2000). As an Associate Professor of Art History at the University of Chicago, she received the Quantrell Award for Excellence in Undergraduate Teaching. Prof. Rowland previously taught at UCLA and Columbia University, as well as in the Rome programs of St. Mary’s College and the University of California, Irvine. After completing a BA in Classics at Pomona College, she earned her Master’s and Ph.D. degrees in Greek Literature and Classical Archaeology at Bryn Mawr College. She has been a Fellow of the American School of Classical Studies at Athens, the American Academy in Rome, the Villa I Tatti in Florence and the Getty Research Institute in Los Angeles.